As a UX team of one, I innovated a new format for planning and presenting usability test results that enabled me to perform 1-2 tests per month, gain stakeholder buyin for findings, and integrate improvements into the team's Agile backlog. Over the course of 10 months, I conducted well over a dozen usability tests, both moderated and unmoderated, as a UX team of one. To facilitate this, I created an innovative memo format that allowed me to plan the test, analyze and report test findings within a single page on the group Wiki. When I arrived at Harvard Business Review, one of my key directives was to establish a cadence of validation and iteration. 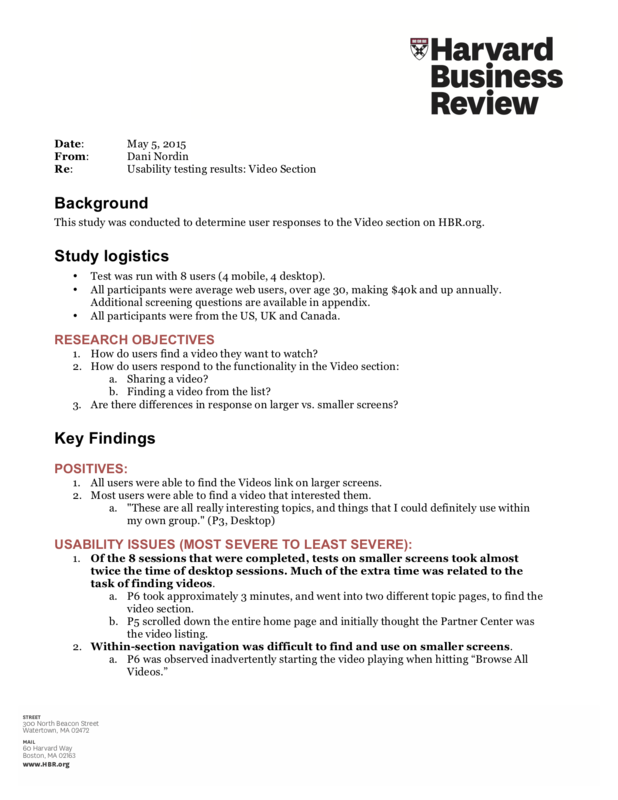 Usability testing was one of the key tools in my arsenal, along with first-click and label testing, expert reviews, and working with the analytics team. I relied on two primary methods for usability testing. The first and most common was Usertesting.com, which allowed me to rapidly create a test and get results within a day or so. Moderated testing was more complex, and usually took a week or two to plan and recruit for, and required coordination with the email Marketing team. In both cases, I started planning by working with the team to establish goals for the test, along with key interactions/screens to include. These were captured on a page in the team Wiki, and I used the information to plan the test protocol on the same page. Notes were captured either on sticky notes, a whiteboard or in the usertesting.com interface during the sessions. Once testing was over, the findings were analyzed and appended to the Wiki page, which served as the final report. Once findings were presented, I worked directly with the product manager to add recommendations as tickets in the JIRA backlog, and followed up on the tickets during subsequent sprints. Capturing goals and important flows prior to testing helped engage stakeholders in the testing process. As time went on, I discovered ways to even further streamline the process, including live whiteboarding moderated sessions with stakeholders, and using Tomer Sharon's Rainbow Spreadsheet to capture findings so data analysis and reporting could be done within half a day instead of 3 days. Using a rainbow spreadsheet makes it easy to capture common observations for faster reporting. 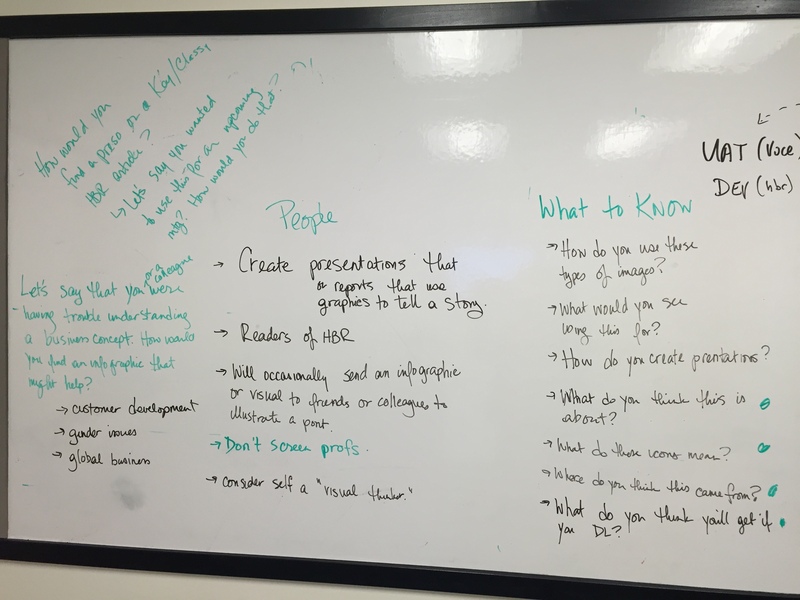 Educated team members and business stakeholders on the value of usability testing. Helped to create a standardized format for getting tickets for improvements into the backlog. Conducted usability testing and presented findings. Refined the format over time to improve clarity and readability.